Not to be confused with Metro Line, metroliner (disambiguation), or Metrobus (South East England). Metroline is a bus company operating services in north and west London. It is a subsidiary of ComfortDelGro and operates services under contract to Transport for London. Operations are split between two registered companies, Metroline Travel Limited and Metroline West Limited. On 1 April 1989, London Buses was divided into 11 separate business units, one of which was Metroline. As part of the privatisation of London bus services, Metroline was sold in October 1994 to a management buyout. In July 1998, it purchased MTL London and in March 2000 was sold to ComfortDelGro. In August 2004 ComfortDelGro purchased Thorpes and in November 2004 Armchair Passenger Transport with seven routes and 86 buses. The coach business of Armchair was absorbed into ComfortDelGro-owned Westbus UK in 2006. Thropes and Armchair initially retained their existing names before being rebranded to Metroline in January 2007. When privatised, Metroline adopted a livery of red with a dark blue skirt. This was briefly changed to light blue in the mid 2000s before the dark blue was reinstated. In June 2009, Metroline adopted an all red scheme to comply with Transport for London requirements. In 2014, a blue, white and red livery was introduced on buses dedicated to non-Transport for London services. 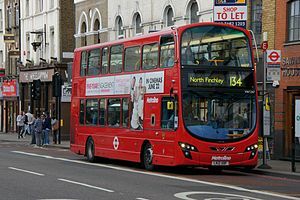 On 22 June 2013, Metroline purchased First London's Alperton, Greenford, Hayes, Uxbridge and Willesden Junction depots with 494 buses. Metroline West Limited operates five bus garages purchased from First London in June 2013. As of February 2017, Alperton garage operated routes 83, 223, 224, 483, 487 and N83. One of three garages built by the London Passenger Transport Board, and the only one to survive, Alperton Garage opened in June 1939, adjacent to the Piccadilly line tube station of the same name. When it opened it had an allocation entirely of STLs which were reshuffled from Cricklewood, Hanwell, Harrow Weald and Willesden garages. As Alperton was a new garage and had plenty of headroom it was one of the few garages able to take utility Guy Arabs, and at one stage these made up its complete allocation and lasted until 1954 when they were replaced by STLs. By 1972 with the arrival of numerous AEC Merlin and AEC Swift class single deck buses to operate the numerous one man operated services, and the further allocation of Daimler Fleetlines, parking space was becoming a problem. It therefore became necessary to park a dozen or so buses on nearby Glacier Metals' car park overnight. The garage was consequently enlarged between 1976 and 1978, which encompassed the adjacent former Underground substation, and the LT Lifts and Escalators department which had to move out to new premises. During the reconstruction works, 18 vehicles were outstationed at Stonebridge (SE). The last AEC Regent III RT buses were transferred out in 1975, and until the beginning of the 1980s, Alperton had an entirely AEC Routemaster and Daimler Fleetline allocation. The first MCW Metrobuses arrived in 1981, and gradually replaced the Daimler Fleetlines on all the one man operated routes, and would become the mainstay of the fleet for many years. Following the September 1982 service reductions, all the remaining Routemasters were transferred to other garages, route 83 and 187 being one manned at the same time. Replacement Metrobuses were allocated to make up the allocation (mainly used vehicles from Edgware (EW), Hanwell (HL), and Fulwell (FW), making the garage all Metrobus. By 1995, Alperton was doing most of the maintenance for the CentreWest operation and had also become the home of the training fleet. On 6 August 2016, route 245 was transferred from this garage to Perivale East (PV) garage. From 10 September 2016, Route 483 will operate from Alperton garage. As of February 2017, Greenford garage operated routes 92, 95, 207, 282, 482 and E6. On 27 May 2017, routes E5 E7 and E9 passed to Abellio London. Greenford bus depot is part of a local council depot and was first used in 1993 as a midibus base. The opening of Greenford garage led to the closure of Hanwell, and in 1995 the garage was operating 110 midibuses. The standard fare of vehicles in the late 1990s were Wright bodied Renault midibuses, and Marshall minibuses but both types had a bad reputation and did not last long. From late 2003 until 14 March 2009 Ealing Community Transport operated route 195 from the Greenford depot using garage code EY. The garage was first opened on Springfield Road in Hayes before moving to a larger depot at Rigby Lane in early 2016. On 11 June 2016, route 195 was transferred from this garage to Greenford (G) garage. On 20 August 2016, routes U4 and U5 was transferred to this garage from Uxbridge (UX) garage. Currently (July 2017) the garage has no operational routes and is in use for vehicle storage only. The original Uxbridge garage was around half a mile out of town on the Oxford Road and was built by the London General Omnibus Company in 1921, but passed to Thames Valley a year later before reverting in 1929 to work its new local routes which were operated mainly by single deckers. An extension was added in the late 1940s and a new garage was planned, although work didn't begin until the 1980s. The new garage opened in late 1983 next to the underground station occupying the lower ground floor of a multi use building. In 1989 the garage began operating the U-Line network of local routes using 16 seater Alexander bodied Mercedes-Benz midibuses (MAs) in an initiative by London Transport. The growth of use of the U-Line services over the years since 1989 has meant that larger buses have been put into service on these routes. The garage also operated the busy 207. In 1994, the garage was allocated some of London's first low-floor single deckers, Wright bodied Dennis Lance SLFs with Centrewest branding for the then operated route 222. On 20 August 2016, routes U4 and U5 were transferred to Hayes. On 3 September 2016, Uxbridge commenced operating route 114. On 11 February 2017, route U4 was transferred from Hayes (HZ) garage to this garage. On 12 February 2017, route N207 was transferred from Hayes (HZ) garage to this garage. On 16 September 2017, Uxbridge commenced operating route 222. As of February 2017, Willesden Junction garage operated routes 187, 206, 226, 228 and 295. North Wembley was opened as a midibus base in 1994, and in latter years buses have been gradually been getting longer, although still single deck. North Wembley had basic maintenance facilities, and therefore some maintenance was carried out by Harrow Weald. On 30 May 2009, North Wembley closed. As at August 2017, the fleet consisted of 1,682 buses. ^ a b c "History". Metroline. Archived from the original on 10 August 2018. Retrieved 10 August 2018. ^ "Company Overview of Metroline West Limited". Bloomberg. Retrieved 11 August 2018. This page was last edited on 8 April 2019, at 23:08 (UTC).